It’s ironic. Kansas is known for its wide-open vistas, where sky meets horizon in every direction. You would think with nothing blocking the view, you could easily see everything there is to see. My daughter, Kelly, and I found out recently that is not always the case. While I love the wide openness of the Kansas landscape, some of the state’s best locations are easy to miss if you don’t know where to look. 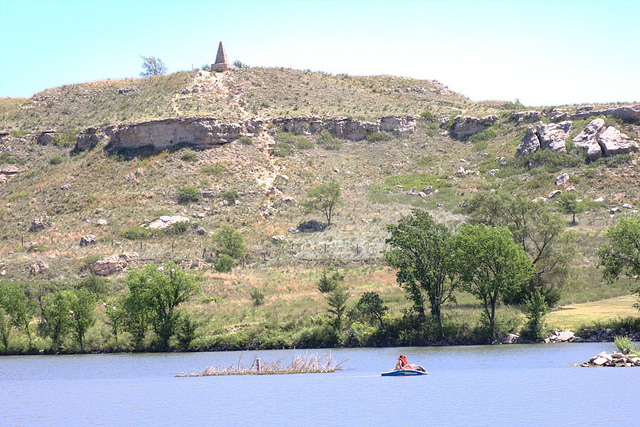 We traveled along the Western Vistas Historic Byway to visit Lake Scott State Park, a truly hidden gem, located between Oakley and Scott City in the high plains. Our GPS said we were only a mile away from the park, but it was nowhere to be seen. In every direction I saw grasslands – pastures, wheat fields, and rocky outcrops – that stretched to infinity, but no park. This is not a complaint, mind you. I love the view. It is the same landscape that greeted the first explorers and traders two centuries ago. Then suddenly the road dropped and we descended into an unseen valley. There before us lay an unexpected sight – a glimmering lake surrounded by orange bluffs and stately trees. Lake Scott State Park filled the valley that had been scooped out of the plains, an oasis below ground level. Kelly and I were not the only ones attracted to this picturesque valley. Long before the valley became Kansas’ first state park in 1928, people have been attracted to the springs from great distances. For example, Pueblo Indians escaping Spanish rule in the Southwest, joined a group of plains Indians in the late 17th century and established the village of El Cuartelejo in the valley. Today visitors to the state park can visit ruins of a pueblo from the village. Just down the road from the pueblo and accompanying historic marker is the homestead of Herbert Steele, who settled in the valley in the late 1800’s. His 640-acre farm is now part of the park and the Steele home is preserved much as it was 100 years ago. Visiting the Steele home reminded my daughter and me of the many homesteaders who came to western Kansas at the time – my grandfather included. Now, many of those farm homes lie in ruins, abandoned relics dotting the plains. Visiting the Steele home reminded us that each of those homes holds a story of early settlement and the human struggle to live in the prairie. These are stories worth preserving and we were glad to have found one such story at Scott Lake. The rest of the park was also a pleasure to experience. Wooded campsites, offering both primitive camping and utility hookups, surround the 100-acre lake, which included a swimming beach, paddleboat rental, and a playground. Trails wind their way around the lake as well, for hikers, bikers and horses. We also spotted a pair of mule deer during our exploration, showing us it is not just humans that are attracted to the waters of the scenic valley. Lake Scott may be hidden from sight, but it’s easy to find along K-95, just three miles west of US-83, which runs between Oakley and Scott City. Since we were in the area, we also visited the larger-than-life Buffalo Bill Statue on the west side of Oakley as well as Monument Rocks located to the east of US-83. Side trips that are worth the time. The lesson of our trip is to keep looking. There are plenty amazing places to visit and stories to experience in Kansas. They may be just around the bend, or below the horizon, but they are there, waiting to be discovered.